SpeechPrompter™, a new mobile application, puts script notes at your fingertips to make presentations go smoothly – even if you’re the leader of the free world. It's a great tool for pastors, professors, sales managers--anyone who has to speak in front of a group. Effective presenters commit the salient points of their presentation to memory, Mondale noted, and then put the script away. But memorizing a speech can be a Herculean feat and may not be practical in some situations. Most people who have to speak in front of a group will at least take note cards or typed pages to the podium for reference as they deliver their address. Now, a new iPad application helps take the stress out of speech-making by providing presenters with a discreet and practical mobile teleprompter. 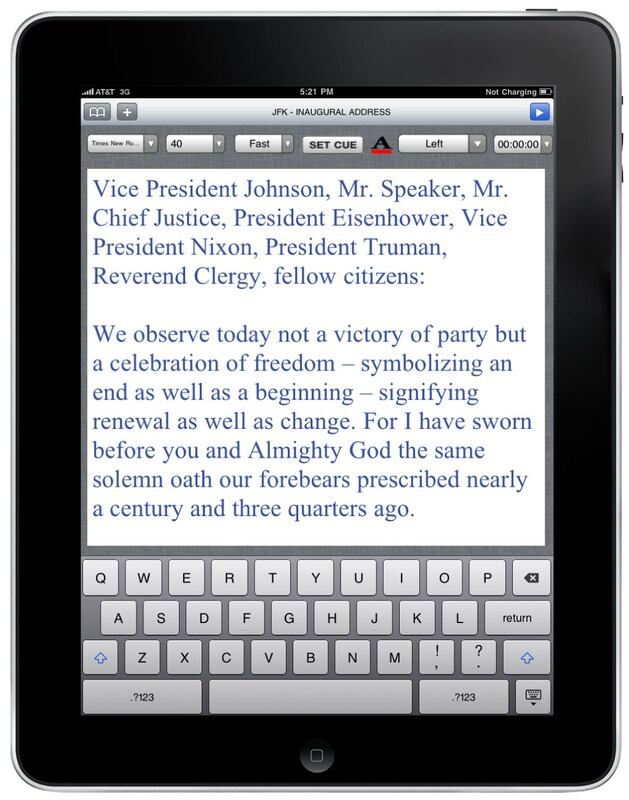 The iPad teleprompter application lets users create and edit speeches and then set their preferred font style, size and color to play the script. Simple finger swipes control the scroll speed, and a timer helps presenters watch the clock. Users can also set cue points in SpeechPrompter, so they can jump to a particular section of the script with two quick finger taps. “It’s a great tool for pastors, professors, sales managers – anyone who has to speak in front of a group,” Thompson says. The Speechprompter app for the iPad is available in the Apple iTunes store for $7.99. The app will soon be available for Android-based pads, including the Galaxy tab from Samsung. For more information, visit http://www.gwhqproductions.com/speechprompter. GWHQ Productions, LLC is a privately owned interactive media and video production company based in the Dallas Metroplex. The company specializes in Website design, print and online marketing, broadcast-quality HD video production, and mobile app development. SpeechPrompter turns your iPad into a portable teleprompterSpeechPrompter lets you load in the text from an existing speech or create a speech directly in the app, and play the text for your presentation just like a top-quality teleprompter! SpeechPrompter script edit functionalitySelect your preferred font size, style and color, and edit your speech text right on your iPad screen.